The costs of the on-going conflict with the Palestinians has caused increased social and economic problems in Israel, with the low-paid and the unemployed hit hardest. Attempts to reduce government spending with cuts in social welfare payments, health and education, are taking their toll, with the number of Israelis living below the official poverty line growing.Food handouts and soup kitchens are increasing to cushion the effects on the poorest members of society, but many families are finding it difficult to care for their children. The charity's first project in Israel, the SOS Children's Village Neradim, opened in 1981 on the outskirts of the pioneer town of Arad in the middle of the Negev Desert. 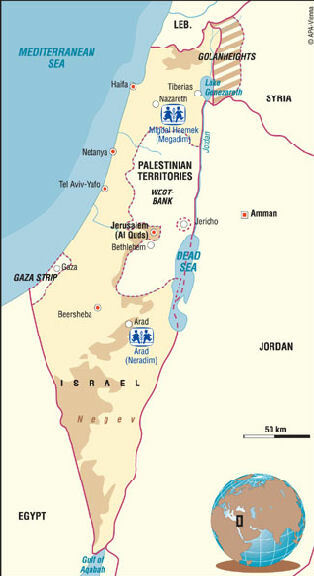 The land, which lies close to the Dead Sea, was donated by the Israeli government. The village has 12 two-storey family houses, staff quarters, a house for aunts and a community house with a large hall. In addition, a youth house was opened in 1988, providing a home for up to 14 teenage boys, and vocational training workshops are provided for the teenagers. The children from the village attend the local schools and nursery and there are full medical facilities nearby. In 1997 the charity opened its second village in Migdal Haemek, in northern Israel, near the Biblical town of Nazareth. The official opening ceremony was carried out by the then state President Ezer Weizmann. The village consists of ten family houses, which provide homes for 80 children. Good educational, medical and sports facilities are all available within easy reach of the village.